"Get up... I'll allow you to die like a warrior." Shenmue's lead antagonist and Ryo's nemesis! Lan Di is a numbered limited edition of only 750 pieces! The 12-inch tall statue includes an alternate right arm. First 4 Figures reveals Shenmue's lead antagonist and Ryo's nemesis: Lan Di. 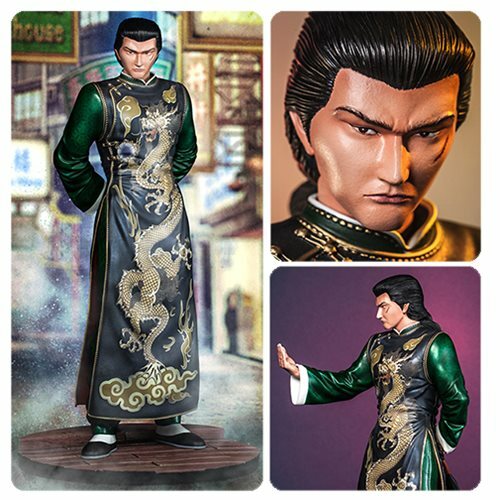 This Sega All-Stars Shenmue Lan Di 1:6 Scale Statue is cast in high-grade polystone, painted to exacting standards to capture the exceptional and intricate details of Lan Di's design. His right arm can be switched out to allow the collector to display Lan Di with both arms behind his back. A limited edition of only 750 pieces worldwide, the statue stands 12 inches tall on a hand-numbered base, comes in deluxe full-color packaging, and includes an authenticity card. Lan Di is arrogantly beckoning, captured in the tense moments immediately after retrieving the Dragon Mirror, and immediately before the brutal demise of Ryo's father. This figure is the perfect complement to the Ryo Hazuki collectible (sold separately). Ages 14 and up. Zhao Longsun (more commonly known as Lan Di) is a Chinese master of martial arts and one of the leaders of a mysterious cartel known as the Chi You Men. Lan Di is ruthless in combat and will not hold back when using his skills to destroy anyone who may oppose him. One of Lan Di's first victims in Shenmue is Ryo's father, Iwao Hazuki, who surrenders an ancient relic called the Dragon Mirror to him. Lan Di is now on the hunt for the Phoenix Mirror, a relic that when combined with the Dragon Mirror could unleash catastrophe upon the world.